STREETBUZZ: Ana, when and where were you born? 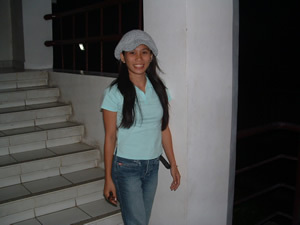 ANA FLORES: I was born September 1, 1978, in Tabon, Dalaguete, in Cebu Province. It's up in the mountain and it's a green and cold place. STREETBUZZ: Please tell us about your family. ANA FLORES: I belong to a very big family. I have six brothers and five sisters. And my mom work very hard to provide us everything we need. Like education, food, and shelter. STREETBUZZ: How about your childhood? ANA FLORES: I am very active, I play a lot. Like, Chinese garter, and shattick (Bisayan word), it's like a marble. My friend when I was young it's all guys, it's very rare to have a girlfriend. I prefer to have friend guys. We also play hide and seek. Yes, I'm very happy in that time. STREETBUZZ: How about your schooling? ANA FLORES: My life in elementary was fun, I have a favorite teacher, her name is Miss Siasico. She's the one who teach me how to declamation. Like you recite a story of your own. and she's the one also who support me to join the ethnic dance group, sometimes she's the one who provide me with costume. Not much fun with high school, it's because I don't stay for one place. From first year to second year, I was studying in Surigao with my father. No much activities to remember. From third year to fourth year, I studied in Mantalongon, with my mom. I start to join some school activities, like singing contest and dancing. And I have already friends, girlfriends. No boyfriends at this time, that's because you can't guys at this time. They're trying to make friends with you first, and then they will ask for more, which I'm not ready yet. So I decided to have just girlfriends at this time. College life it was so difficult for me. Cuz new environment and I have to look for new friends. And this time I should be responsible enough, to take care of my own self. It's because I'm very far with my family. Even though I live with my four sisters, but still it's different living with your mom. In city's a big place, I'm scared because I don't know yet everything will happen to me in the city. And since I am the younger one, so I'll be the one to take care of the household and everything. Like budgeting allowance for food, and cleaning. In college, it's different, it's really different. Because people are matured, and they're not very approachable, like in the mountain. At first it's very hard to get a new friends. And even though I like to have friends who are guys, I prefer to have a gay at this time. It's because college life, there are a lot of malice already. So I choose gay. I still have guy friends, but I stay away from them, for some reason. And it's a secret. STREETBUZZ: So, you graduated from which college and what's your degree? 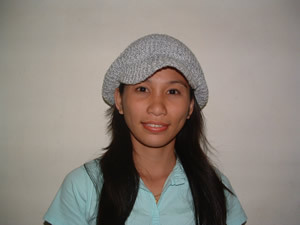 ANA FLORES: I graduated University of Cebu in 1999, bachelor of secondary education. Majoring in physical education, health and music. ANA FLORES: After I graduate, I look for a job. My first job was in National Bookstore in SM (ShoeMart Mall in Cebu City.) I enjoy my first job, it's a sales clerk, because it helps me to gain more confidence in myself, facing different people every day. I have lots of friends: my co-workers and customers. STREETBUZZ: Briefly, how about your other jobs since that time? ANA FLORES: Global Learning Company, the first two years it's fine, but after that the management is not good anymore, so I decided to resign. It's a consignment distributor that sells books inside of National Bookstore. STREETBUZZ: Did you meet any particular special guys when you were doing that job? ANA FLORES: Maybe. Not sure yet, if he's really special to me. It's because, until now, I still think about him, and I don't know how you will describe it. STREETBUZZ: Briefly, your other jobs after Global? ANA FLORES: I only worked for National again for two months, that was until I resigned this past July 1. It's because I decided to have my self-review for teacher's board exam. It will be my third time to take the board exam, and this time I really want to pass the board exam, and I'm serious about it. And also because my boyfriend doesn't want me to be working when he returns from Sweden. STREETBUZZ: So you want to be a teacher? ANA FLORES: Maybe yes, maybe not....that will be my answer as of now. STREETBUZZ: Tell us about your boyfriend. ANA FLORES: Which one, the one before, or my present boyfriend? ANA FLORES: They're both guys. One is tall and one is short. But I'm talking about their height (laughs.) Where should I start? The first one, cuz he's the first one. Maybe he's going to kick me out, if I won't tell he's the first one, because he's sitting beside me doing this interview (laughs again.) So, I have to start, just, he's nice, that's it. I'm just kidding. One thing I like him, he respect me so much. and that's one of attitude that I look for a guy. And he's willing to help me with my board exam. Which is very ironic to my present boyfriend. It's because he don't want me to be a teacher, it's because he said I would not have enough time for him anymore if I'll be a teacher. But since it's my choice, sometimes he help me. My present boyfriend, he arrived at the right time, that I was very depressed and curious to something. And he's the one who comfort me. And I get tempted (more laughter.) So I stay with him. ANA FLORES: Of course, I love the Philippines because it's my country. Even I know it's not perfect. But it's a beautiful place to live. It's a slow country, but people are very friendly. And respectful. STREETBUZZ: But the Philippines in also a nation in deep, deep crisis on so many levels. What you think? ANA FLORES: It's true. Not more to say. STREETBUZZ: How about your future? Any plans / wishes / desires / fears? ANA FLORES: Future? I don't know yet. Plans? I have, if I have chance, if I pass the board exam, then I'll be a teacher. And as of now, if I have a opportunity, I really want to work for abroad. But it's just a plan. STREETBUZZ: Why you want to work abroad? ANA FLORES: I really want to help my family. And I know, if I just work here, in the Philippines, my salary will be enough for myself, even you will be working very hard. That's it. STREETBUZZ: What's your favorite food, color, music, and any other things on your "favorites" list? ANA FLORES: Any food except shrimp and crabs, it's because I'm allergic to that. Color, I'm not sure if white is a color, but I like it. Music, mellow, and disco music. Can I add something to that, other favorites list? I like Tweety! STREETBUZZ: Anything else to say? ANA FLORES: If you saw my picture and are interested, I'm single, available, but not negotiable (laughs hard.) Don't write that, I'm only joking! Ana is now living in Vancouver, Canada, with her Canadian husband.